British, French, Italian, Spanish and Dutch leaders are gathering in the German capital to hammer out a European stance to take to a summit of the G20. Sometimes it's not just what is said that counts, but the way it is said. And if tone is anything to go by, the leaders of the European Union's largest economies are dead serious about cleaning up global finance markets. On Sunday, officials from eight E.U. countries wound up an economic summit in Berlin calling for tougher regulations on international financial marketsincluding secretive hedge funds and the tax havens they often rely on to do business. The question is: will the U.S., the biggest financial player in the world, ever agree to the binding international regulation the Europeans seek? French President Nicolas Sarkozy was just as adamant. "We can't afford failure in London," he said after Sunday's meeting. "We have to succeed and we can't accept that anyone or anything will get in the way of this summit, which will be a historic summit. We will be successful [because] if we fail there will be no safety net." Duckenfield notes that political conservatives such as Sarkozy and Merkel have a significant ally to their cause in British Prime Minister Gordon Brown, who, in spite of his nominally leftist Labour Party affiliation, has always been a market liberal. As recently as 2007, Brown opposed European calls for better regulation of hedge fundsinvestment schemes that had helped made London Europe's finance capital. But on Sunday, Brown wrote in Britain's Observer newspaper that finance markets and banks should be obliged to factor the collective interest of long-term economic gain into their activities, an effort he said should serve as "the foundation on which a new system must be based". Sarkozy went even further, demanding new regulations that would impose responsibility and moderation where excess once reigned. 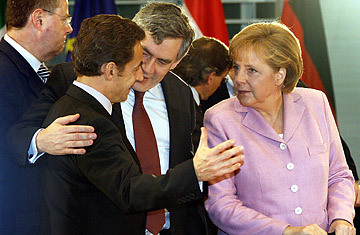 After the meeting, Sarkozy said that "the violence of the [economic] crisis, its depth, call for really profound changes." He also claimed the European objective going into the G20 meeting is to " to start capitalism again from scratch, [and] make it more moral". Dramatic stuffbut will it ever fly in Washington? Or even everywhere in Europe? "If I put it very tenderly, the divergence in opinions was rather big," said Czech Prime Minister Mirek Topolanek, whose country currently holds the E.U. 's rotating presidency. In Sunday's meeting, Topolanek defended the liberal market orthodoxy of many central European members and the U.S. is likely to look to countries like the Czech Republic for support in defining some "lowest-common-denominator rules" that everyone can accept, says Duckenfield. Which may leave other European leaders talking tough but unable to get their way. See pictures of the decline of the American economy in 2008.